Click the Link to learn more about Vectra DA, and exactly how it’s helping thousands of RAers like me! I’d love to go into scientific detail on exactly how this cool test works on just one vial of blood, but I think what’s more important is how it’s affected me and changed my life. He told me straight to my face that he believed all my symptoms were “not due to the Arthritis” and that it was “in my head.” He then continued to tell Andres and I that there was nothing that we could do and I would never be able to do things normal people could do or walk without pain again. I was in tears and Andres was just plain angry. We never saw him again after that. A week later we found my this amazing Rheumatologist and he told me he believed he could get my Arthritis under control and that same day he started me on Enbrel. It worked great for about a year, but my lovely antibodies decided it was time to to say bye-bye and it stopped working. The appointment right before our wedding, we all decided that when Andres and I came back from Hawaii, I’d be switched to Remicade. I had very high hopes, knowing many of my rheumy friends responded well to this drug, but unfortunately, it didn’t work for a second. every. single. day. Not to mention, writing about all the pain, stiffness, swelling, nausea, etc I was feeling each and every day felt more like a chore instead of something I actually looked forward to. It got old quick. So when I downloaded this app and saw how easy it was to use and fun even with the little MyRA cartoon, my hubby, intrigued, looked up the company. He saw that the company, Crescendo Bioscience, had just recently developed this advanced blood test for people with Rheumatoid Arthritis. After reading about the test we immediately talked to my Rheumatologist about it, who thought it was a marvelous idea, and two weeks later we got the score showing High Disease Activity. The results felt so accurate to me, that I was in shock! I’m not recommending everyone with RA take this blood test just because it’s the latest technology and the first multi-biomarker blood test for RA. I’m recommending everyone take it because it truly helped me and changed my life. Rheumatoid Arthritis is largely an invisible illness, until its not. You can’t detect that damage is happening until it’s already happened. For me, because I haven’t experienced lots of joint damage, my doctor didn’t believe my symptoms were real! 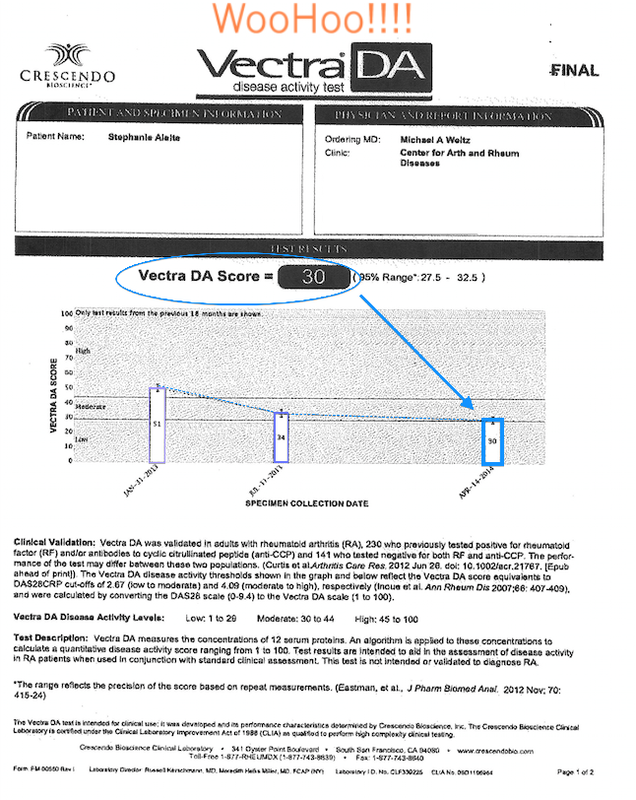 Getting the Vectra DA test done not only saved me a lot of time because I can see if the treatments are working or not, but it also gave me confidence in myself and in my doctor that we are on a path to better health. So now that I’m feeling way better and I have finally found a treatment that has been proven to work, I’m on to the adventures I’ve been planning for years now! …..Maybe I should rename this blog to: The Adventures of Arthritis Girl. *This testimony is based on my personal experience. I am not a medical professional, but urge anyone interested in taking Vectra DA to seek the advice of their doctor.